Their mission: ELLA Book Club seeks to promote reading among U.S. Latinas by featuring fun, modern books by Latina authors who write in their native language - and the primary language of the vast majority of Latinos in the United States - English! The book club is proud to partner with MANA, a National Latina Organization. NOTE: ELLA National U.S. Latina Book Club is owned and operated by bestselling author Alisa Valdes-Rodriguez. If you are interested in having your book included in our selections, please have your publisher contact Alisa at valdes.alisa@gmail.com. It’s the first in a new suspense series from Ms. Castillo. 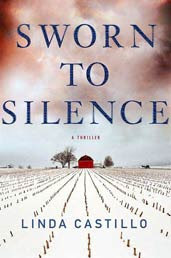 It’s about “a gun-toting, cursing, former Amish female chief of police” after a serial killer in Painters Mill, Ohio.